It is important (at least for me!) to have a sufficient stash so I can rotate the usage to make sure that these investment will last long. After all, one of the benefits of using cloth diaper is to save money. So it is good if we can use these diapers for multiple babies - well, 2 babies at least or 3 babies if you have lots of stash to rotate and keep them in a good condition. 1 BumGenius! Freetime AIO - love the Albert print! As I wanted to start cloth diapering Baby Iqbal for nighttime, I have also bought Bamboolite foldover inserts so I can put them in the Autumnz diapers. Received a good review about it from Rozi. 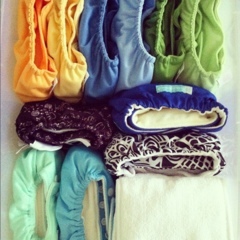 Although few cloth diapering mom here actually use Flip and double the inserts or use the LoopyDo or SuperDo for nighttime diapering. As Baby Iqbal is still small, I do not want his diapers to be bulky. I hope the foldover inserts will not be really bulky for him.